Backpacks bigger than our bodies. That church! That café! That door! Everything so old it’s new. We learn to get out of the way. Quick prayer for minimal damage. The lights along the Seine double their glow. Because you can do anything! The rest of us hoping she’ll share. Considering I love the French language (I requested a Collins French dictionary for my 14th birthday) and reading about their culture, I was surprised I hadn’t heard of this collection of essays on Paris. I had read Hemingway’s memoir but not Adam Gopnik‘s, a staff writer for The New York Times who lived in the French capital from 1995-2000 with his wife Martha and their newborn son Luke. It was a very serendipitous read. Many months before knowing about the book, The Artist and I had booked our accommodation on the Left Bank in the Saint-Germain-des-Prés area of the 6th arrondissement. We/I chose it because of its artsy and intellectual heritage. This district had a vibrant café culture in the 20th century where Ernest Hemingway, Gertrude Stein, Jean-Paul Sartre, Simone de Beauvoir, and the like would think their thoughts, exchange their thoughts, and write their thoughts. I wanted to feel a part of that, even if the area is more glam than bohemian now. Guess where Gopnik and his wife lived during their time there? 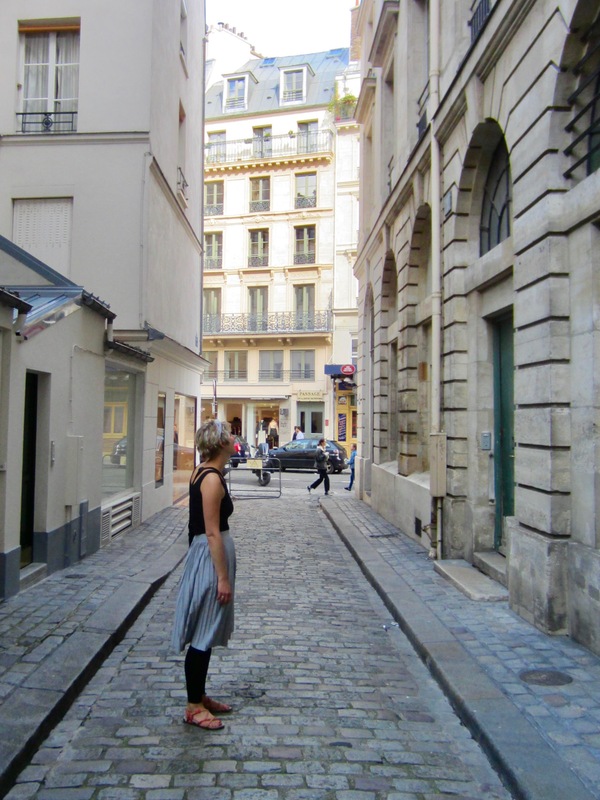 Saint-Germain-des-Prés, literally just a few blocks from where we’re staying! I basically read this book with a map in my other hand so I could follow his daily visit to the butcher and baker, his favourite walk pushing the stroller across Pont des Arts, his run around Luxembourg Gardens (using the busts of Delacroix as his reference point) and his route to fulfill un café crème or bûches de Noël craving at Gérard Mulot or Ladurée. After reading so much guidebook-type information on Paris, it was refreshing to vicariously live “ordinary” Paris. When Gopnik mentions iconic landmarks like the Eiffel Tower, he talks about it in the context of something unexpected, like a news story that involved a clash between an American tourist and a French elevator operator. He uses this story as a springboard to philosophize on a key difference between the two cultures (absolute professionalism versus absolute tourism). I’ll leave it to you to guess what ideal goes with what culture. But it is his reflections that come out of raising his son in a new place that stay with me the most (and provided some chuckles). He swam, I realized, exactly the way that after five years I spoke French, which also involved a lot of clinging to the side of the pool and sudden bravura dashes out to the deep end to impress the girls, or listeners. Midway through the book, Gopnik confesses the real reason he and Martha packed up their New York life and moved to Paris was to avoid raising their son with Barney and all that that inane purple dinosaur represents in American culture. ‘We want him to grow up someplace where everything he sees is beautiful’ we said, and though we realized that the moment our backs were turned our friends’ eyes were rolling, we didn’t care. We knew that our attempt to insist on a particular set of pleasures for our kid—to impose a childhood on our child—might be silly or inappropriate or even doomed. We couldn’t help it, entirely. The romance of your child’s childhood may be the last romance you can give up. (spoiler alert: life doesn’t turn out the way you plan, leading to some hilarious moments in the “Barney in Paris” chapter). Perhaps I enjoyed this book so much because I share the author’s romantic inclinations and could picture myself writing a book like this, my own Paris to the moon adventures while sitting in a garden or café. While we’re only there a week and I have a tendency to sightsee ambitiously, this book makes me want to pause long enough to notice the light. We love Paris not out of ‘nostalgia’ but because we love the look of light on things, as opposed to the look of light from things, the world reduced to images radiating from screens. Paris was the site of the most beautiful commonplace civilization there has ever been: cafés, brasseries, parks, lemons on trays, dappled light on bourgeois boulevards, department stores with skylights, and windows like doors everywhere you look . . . I see the moon these days from Paris because I once saw Paris from the moon. As I will be visiting Paris for the first time this year, I’m getting more and more excited by reading stories set there. I recently finished The Paris Wife by Paul McLain that fictionalizes the marriage of Ernest Hemingway to his first wife Hadley Richardson from 1921 to 1927. The story is told through Hadley’s voice. There are always two sides to a story and after discovering Hemingway’s Paris memoir A Moveable Feast that also focuses on his years with Hadley, I was intrigued at what her version would say. Since she didn’t write her own memoir, we have to rely on McLain’s research. This isn’t a detective story—not hardly. I don’t want to say, Keep watch for the girl who will come along and ruin everything, but she’s coming anyway, set on her course in a gorgeous chipmunk coat and fine shoes, her sleek brown hair bobbed so close to her well- made head she’ll seem like a pretty otter in my kitchen. Of course, when someone says don’t keep watch that’s the very thing I do. Every time there was a new woman introduced into the story (and there are a lot of characters since Hadley and Ernest hung around other expat artists and their partners like the Fitzgeralds, Gertrude Stein, and Ezra Pound), I wondered if this would be the woman who destroyed their marriage. I also kept watch for Hemingway. I noticed McLain treated him very carefully—too carefully. It seemed as if she wanted to acknowledge his cruelty towards Hadley while still making him likeable. There are hints of Hemingway’s bravado and aggression in living room boxing matches he has with friends and in his appetite for watching Spanish bull fights, but apart from one tumultuous quarrel, all his and Hadley’s marital tension is unsaid or so subtle it feels unrealistic. For a character known as a hothead, Hemingway speaks remarkably cool, reserved, and casual throughout the novel. I felt for Hadley in the net she was caught in—trying to believe in marriage in an age and place where marriage was becoming less and less defined. Men tried keeping a wife and a mistress in the same house. Hemingway and Hadley tried this with their friend Pauline who ended up being the woman to keep watch for, and you can imagine this arrangement worked out swimmingly for everyone involved (high sarcasm there). Not everyone believed in marriage then. To marry was to say you believed in the future and in the past, too—that history and tradition and hope could stay knit together to hold you up. But the war had come and stolen all the fine young men and our faith, too. There was only today to throw yourself into without thinking about tomorrow, let alone forever. To keep you from thinking, there was liquor, an ocean’s worth at least, all the usual vices and plenty of rope to hang yourself with. But some of us, a very few in the end, bet on marriage against the odds. And though I didn’t feel holy, exactly, I did feel that what we had was rare and true—and that we were safe in the marriage we had built and were building every day. Was Hadley as naive as McLain makes her out to be? I don’t know. I think you can be hopeful without being naive, but it does take her an awfully long time to clue into her husband’s infidelity. She is a good and faithful wife, but as Aritha van Herk writes in her review in The Globe and Mail, there are some definite moments in the book where Hadley could have been more nuanced, like when she loses a suitcase carrying literally all of Hemingway’s work (it was stolen on a train). She is all tears and apologies, but doesn’t she ever have moments of selfishness? Hemingway certainly did. In reading this fictionalized memoir in the 21st century, I found it hard to completely sympathize with Hadley because she is portrayed as perfectly content to make her life dreams her husband’s. Her biggest streak of independence is playing the piano and practicing for a concert that she never ends up doing because that’s when she finds out about the affair. Certainly not every woman in this time period sacrificed like Hadley—look at Zelda Fitzgerald. Not saying she’s a healthy example either but finding your identity in your husband’s doesn’t leave you with much when the marriage dissolves. I’d recommend reading A Moveable Feast and then The Paris Wife to see how the two accounts compare since McLain heavily drew on Hemingway’s memoir to create her version of this famous and tragic marriage.